Any fears that Bishop Gorman might suffer a letdown after last week’s emotional nationally-televised upset of then-No. 1 St. John Bosco lasted about 12 seconds Thursday night at Fertitta Field. That’s how long it took for sophomore quarterback Tate Martell to throw the first of four first-half touchdown passes, a 50-yarder to tight end Alize Jones, as the Gaels (7-0, 1-0) bolted to a 42-0 halftime lead en route to a 56-0 victory over Shadow Ridge (2-3, 0-1) in the Southwest League opener for both teams. 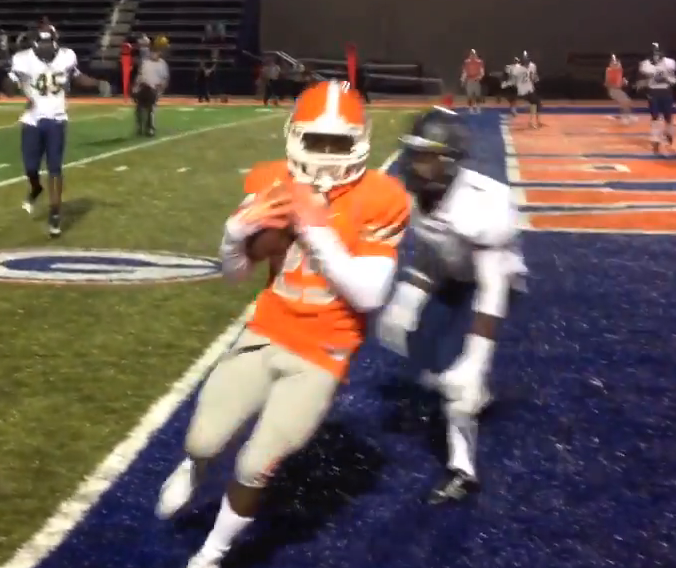 It actually only took two offensive plays for Bishop Gorman to go ahead 14-0. Martell hit Tyjon Lindsey on a post pattern on the first play of the Gaels’ second offensive possession and the explosive 5-foot-8 sophomore did the rest, racing 75-yards for a touchdown, and the rout was on. Martell, who departed late in the second quarter, finished 8-of-11 for 205 yards, four touchdowns and no interceptions while Lindsey caught three passes for 109 yards and two touchdowns and the UCLA-bound Jones finished with two catches for 71 yards and a TD. Cordell Broadus also caught a touchdown pass. Backup quarterback Danny Hong also joined in the fun, throwing touchdown passes of 7-yards to Austin Arnold just four seconds before halftime to make it 42-0 and a 2-yarder to Noah Hill in the fourth quarter to conclude the scoring. The Gaels, who moved into the No. 1 spot in USA Today’s Super 25 Rankings on Monday, also got rushing touchdowns from Russell Booze (1 yard) and Jaylen Carroll (5 yards). Gorman played its backups the entire second half and the final 18 minutes were played with a running clock. Shadow Ridge, which tried an onside kick to start the game that was recovered by Wyatt Skurski, drove to the Bishop Gorman 25-yard line on its first offensive series of the game before turning the ball over on downs and never got closer than the Gaels 49-yard line the rest of the way. Gorman returns to action on Oct. 10 when it plays at Durango (1-4).